Starting off a season on the wrong foot can set a negative tone and generate a sense of frustration over the next several games. Sometimes hockey players get that feeling there is nothing they can do to stop the bleeding of bad play. One thing goes wrong, then another, then another and it snowballs to the point where you feel you can do nothing right… That feeling is frustration and it is on a seek and destroy mission with you as its target. Then one shift, you make a bad pass, the puck is poke checked away from you another time and a defensive breakdown occurs and it’s your fault! On your next shift, you play a little more cautiously but the bad plays pile up. Sound familiar? You may have made some blunders but the biggest mistake you made was allowing frustration take over your mind. 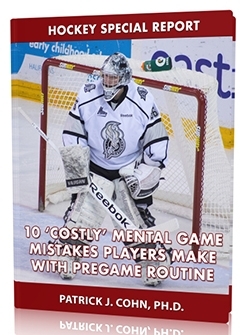 Many athletes become easily frustrated after making mistakes. You may feel like you failed and have disappointed your team. But holding onto those mistakes ingrains them into your mind. When you become frustrated, you relive mistakes in your mind and beat yourself up over something that every athlete makes. It is impossible to not make mistakes and unrealistically hold yourself to that standard. 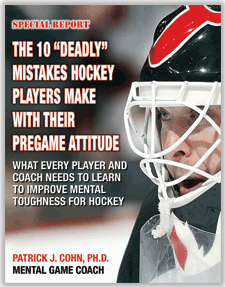 Failing to let go of mistakes and move past them sabotages your play on the ice. The Calgary Flames have high hopes for the 2015-16 season. Last year, the Flames made it to the second round of the playoffs but were ousted in the Conference Semifinals by the Anaheim Ducks 4-1. But so far, the Flames are having a frustrating start to their season with a 1-4 record and an average of 3.8 goals allowed per game (3rd worst in the league). The Flames also rank near the bottom in scoring averaging only two goals per game as compared to 2.89 goals per game last year. The Flames opened the 2015 season with a 5-1 loss to the Canucks, the team they beat in the playoffs last year. Flames defenseman Kris Russell thought his team allowed frustration to build up and seep into every aspect of their game which lead to their horrible showing in their home opener. When you hold onto mistakes tightly, they morph into overwhelming frustration. At that point, you are battling two opponents: the other team and your biggest adversary, frustration. 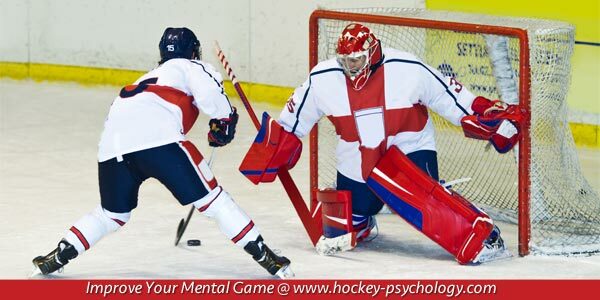 Work on developing a different response to mistakes and strengthening your mental game.